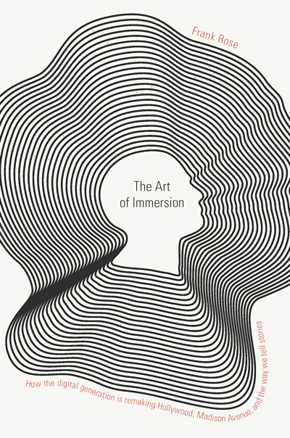 From the moment I published The Art of Immersion—what, five years ago?—I've been focused on the idea that digital means blurring boundaries. The in­dustrial age was all about categorization, in media as elsewhere: You had news­papers, magazines, movies, radio, television, each with its own dis­tinctive format and delivery mechanism. To see a movie you went to a movie theater; to listen to radio you turned on the radio; to watch television you turned on the TV set; to read a newspaper you had to pick it up from the driveway. But now, except for the movie theater (sometimes), that's all rapidly becoming history. So why do digital me­dia—books, video, video games, advertising, art, journal­ism—still exist for the most part in their own separate universes? Not that they'd ever be the same thing, but you might expect more crossover. That was one of the questions I had in mind when I helped launch the Colum­bia Digital Storytelling Lab's "Digital Dozen: Break­throughs in Story­telling." A year ago I wrote about the newly re-imagined Cooper Hewitt, the Smithsonian's design museum in New York, for my friend Betsy Pochoda, editor of The Magazine Antiques. Cooper Hewitt set out to reinvent itself as a center for highly participatory and deeply immersive experiences, not the musty storehouse of old stuff that design museums generally seem in danger of becoming. It even has an "immersion room" where visitors can use a digital projector to see what its wallpaper samples would look like on the walls. Now it's about to mount a show called "Thom Browne Selects," an "immersive environment" guest-curated by the fashion designer best known for gray flannel suits that stop well above the ankle. So when The New York Times asked me to interview him over the holidays for a piece on the show, I jumped at the chance. Thom Browne at his favorite lunch spot: The Four Seasons restaurant in Manhattan. When Advertising Week happened a couple of weeks ago, I joined a discussion about Absolut Silverpoint, a marketing campaign that ran in London for 14 days last April. Silverpoint was noteworthy because it was an app, not an ad. It didn't take over your computer screen unbidden; you had to download it. It was the kind of marketing people actually want to experience, as opposed to the kind they go out of their way to avoid. It was immersive, not intrusive. As Brand Republic put it, "Absolut's Silverpoint app has taken over our lives." Which makes it a sort of model for what marketing has to do in the future. On Thursday, October 15, Afdhel Aziz, brand director at the idea incubator Absolut Labs in the US, will join Paul Woolmington and me as a special guest at our seminar in Digital Storytelling Strategy. For more information, please visit the Columbia University School of the Arts or Columbia Business School Executive Education. How did it work? It started off as a simple iPhone game you could download from the Apple Store. As you played it, it morphed into a story—a mystery story about a woman named Chloe who has gone missing. New bits of story were unlocked as you moved up through the levels in the game. Finally it morphed into a live theatrical experience staged by Punchdrunk, the company behind Sleep No More, the immersive theater production that's been running in New York for more than four years now. Ad-blockers have given consumers a voice in the online ad world — and that voice is loud, it is clear and it is filled with venom. Track our behavior without our consent and serve “targeted” ads that make us feel stalked. —Block you. Serve us ads that cover up the inferior content we read mostly to kill time. —Block you. Force auto-play video ads down our throats, so we have to race to find our mute button. —Block you. Serve us flashy ads that slow down the page load. —Block you. Allow anyone to buy ads through exchanges, so our computers get infected with malware. —Block you. Serve us too many damn ads on a single page of content. —Block you. Ad-blocking could cost Web publishers nearly $11 billion this year, according to a report from Adobe and PageFair. In fact, the IAB has a de­tailed code of con­duct for its mem­bers, though that obvi­ously hasn't fixed the prob­lem. But Ran­dy—whom (full dis­clo­sure) I've known for years, and who gave me a lovel­y blurb for my most re­cent book—does­n't really need me to de­fend him. The point is that the sins list­ed here—online stalk­ing, auto-play vid­eos, mal­ware in­fes­tations, ram­pant clut­ter, and so on—have be­come ubiq­ui­tous, and they're al­most guar­an­teed to make con­sum­ers ven­omous. They cer­tainly make me feel ven­omous. And as the au­thor of this post was try­ing to point out, they make a ter­rific case for ad-block­ing. Are Web metrics corrupting online media? We're sup­posed to be living in an "attention econ­omy," right? But standard Web metrics don't really measure attention. Uniques, page views, monthly aver­age users—none of these take into account how long a visitor spends, whether the visitor is satisfied, or even if the visitor is human and not a bot. For all our talk of Big Data, au­di­ence measure­­ment remains a remarkably crude sci­ence. And yet, because ad­ver­­tisers and in­vestors rely on these metrics, they have a distorting effect on social media and pro­fessional media alike. This has been one source of Twitter's problems, but it's even worse with online journalism. If the sites with the most uniques win, it's easy to game the system by baiting users with value-free content. So cheese­ball aggregators like Viral­Nova—which just sold for something approaching $100 million—get rewarded, while more serious stuff is penalized. When people fall for crazy clickbait come-ons, you won't believe what happens next. I've been fasci­nated by this phenom­enon at least since 2009, when my colleague Daniel Roth pub­lished an excellent story in Wired called "The Answer Factory." It was about Demand Media, a self-aggrandizing start­up whose stated mission was to pub­lish "what the world wants to know and share"—which turned out to be a cynical euphem­ism for "what we can stuff with ads and trick peo­ple into click­ing on." Online journalism: The imitator's dilemma? When I talk about the future of media, one of the images I use to illustrate the transition from industrial-scale, mass-circulation newspapers to what we're seeing now is this one. It's from the August 28, 1835 edition of the New York Sun, the paper that gave rise to the "penny press," the journalistic innovators that jump-started the transition to industrial-scale mass media. Steam-powered presses were now making it possible to print far more newspapers in a couple of hours than ever before. But no matter how fast you printed them, you couldn't make money selling these papers for a penny. So The Sun, founded by a 21-year-old entre­preneur, became one of the first American news­papers to hire journalists. More stories would draw more readers, the thinking went. And Day could sell those readers to advertisers, instituting the business model that news­papers have used ever since. As The Sun's digital successors can tell you, attracting readers isn't all that easy. But then, two years after its founding, The Sun pulled off one of the greatest media coups of all time: an exclusive report on a civilization of moon-dwellers that had supposedly been discovered by the great astronomer Sir John Herschel, using a telescope so powerful it caught fire and burned up the observatory. Readers were agog. Even scientists were taken in. Not until weeks later did The Sun admit it was all a hoax. Well, at least they didn't resort to listicles. More and more television is being viewed on computers, smartphones, and other devices. At the same time, there's an upsurge in the amount of television that's streamed rather than watched live. For large numbers of viewers, what we now call television is becoming un­coupled from the TV screen, from the TV schedule, and from con­ventional TV providers like cable and satellite. The impli­cations are huge. Network pro­gram­mers will find their once all-important scheduling func­tion becoming increas­ingly obsolete. And cable and phone com­panies will find their Inter­net business out­pacing their TV bun­dles both in importance and profitability. "Great brands and great businesses have to be great storytellers too." So begins a video that Angela Ahrendts, then CEO of Burberry, prepared a couple of years ago for New York's annual Future of StoryTelling summit. Before she left last year to take over retail operations at Apple, Ahrendts and her creative director and eventual successor, Christopher Bailey, led one of the most remarkable luxury brand turnarounds in business history. And they did it on the power of story—which is why Paul Woolmington and I use Burberry as a key case study in our Columbia seminar on digital storytelling strategy (details below). Lots of marketers are talking about storytelling now, but few really understand how it works or why. Burberry does. They're using it both literally, in videos and store displays that highlight the heritage of the brand, and in a larger sense, by creating a "story world" that customers can step into at will. Because we understand stories by projecting ourselves into them, humans have an innate desire to inhabit stories we find meaningful. And because what we wear says so much about who we are—or at least, who we aspire to be—this can be as true of a fashion brand as it is of, say, Star Wars. In an article in Admap a couple of years back, noted branded content guy Graham Hodge said some very nice things about The Art of Immersion but observed quite rightly that the book "stops short of offering advice to brands." Since then, I've spoken at marketing conferences in cities from London to Lima to Ljubljana and teamed up with Paul Woolmington to launch a day-long exec ed seminar on Digital Story­telling Strategy at Columbia—so I figure it's time to fix that. To that end I worked with Art Kleiner, the editor of strategy+business, to develop an article that would explain immersive storytelling from a brand perspective. What does it really mean? How does it work? How does it compare with conventional advertising? And what makes it so effective? The result is "The Power of Immersive Media," which just went up on the s+b Website and will appear in print in the spring issue of the magazine. To sum it up, I've developed the downloadable infographic below, which is being published by Columbia's Digital Storytelling Lab. It's a happening time for museums. The Louvre, the world's most-visited, drew 9.3 million people in 2013. American museums get more visitors than theme parks and major league ball games combined. In a world of ubiquitous electronic screens, this puts the lie to the notion that we're growing divorced from the physical world—or so it would seem. In fact, the appeal of museums goes beyond the objects they hold. Their popularity has a lot to do with the way they're merging the digital and the physical—and shifting their focus from object to experience in the process.